Police are still at the scene of a stand-off at flats in South Shields after almost 30 hours. LATEST - Armed stand-off comes to an end. More here. Police have been on the scene at Lorrain Terrace throughout the night. The block in Lorrain Road remains closed off after police spent the night negotiating with a man inside. The incident began at around 11am yesterday. Detective Superintendent Mick Paterson, of Northumbria Police, said: "Negotiations are ongoing with a man at a property on Lorrain Road, South Shields, who is described as being in a distressed state. "Police remain at the scene to support the man and offer any reassurance to residents. The incident in South Shield's is still ongoing. "Anyone with any concerns is asked to speak to a nearby officer." Police have relaxed a cordon which was initially put in place so people can move between the streets more freely, but it remains in place in front of the flat. One man, who lives in the area, said: "We were asked by the police if we would leave the property, it was about 6pm when they asked us to leave. We've been out all night and now can't get back in. "He has been living in the flat for years. It's been pretty quiet apart from the negotiators." Police surround flats in South Shields. Up to eight Northumbria Police vehicles were in Lorrain Road, Whiteleas, yesterday as the talks with the man continued. 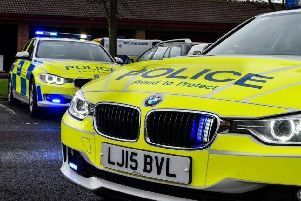 A Northumbria Police spokesman said yesterday: "Police assisting South Tyneside Council with a gas service warrant located a man at an address on Lorrain Road, Whiteleas, described as being in a distressed state. "He had locked himself inside the property and was unwilling to leave. “Officers are currently at the scene and are negotiating with the man in question." Armed police in South Shields this morning. A neighbour said this morning: "The police have been here all night but nothing much has been happening. "They've had dogs going in and out throughout the night. A lot of the police have gone who were here last night, but I think some have been here all night." One woman on the scene yesterday said: "I passed at 1pm and saw the police had closed the road. “A man has locked himself in the flat and is refusing to come out - there was a rumour he had weapons but how much of it is true is anyone's guess." A man, who was walking past when he saw the police in the street, said: "Loads of people have been out watching what's been going on. I think he's in his 30s or something. I didn't think it would go on as long as it has." It was reported that officers with shields and police dogs had been seen going into the flats. The negotiations are still ongoing at flats in the town. A council spokesman said: "Council officers, with the assistance of Northumbria Police, attended a property on Lorrain Road, South Shields, to gain access to a property as part of our annual Gas Safety Inspections on behalf of South Tyneside Homes." Police have been on the scene throughout the night. The streets are still cordoned off. Lots of police cars are on the scene.